The Enduro line is an opaque paint just like latex, but at spray viscosity so thinning is not necessary. This is a pigmented poly that’s perfect for cabinets, furniture millwork or anywhere a tough and and non-yellowing finish is required. Easy to sand with good adhesion. Available in white, black as well as custom colors from the chart. Note that we cannot match other manufacturer’s colors. A typical paint finish uses 2-3 coats of primer. Sand the first coat with 220, the second with 320. Remove all the dust and then apply 2 coats of paint. If more durability is required, (wash/scrub resistance), apply 1-2 coats of Enduro Clear Poly over the paint when dry. Enduro Pigmented Poly – This is a pigmented poly that’s perfect for cabinets, furniture millwork or anywhere a tough and and non-yellowing finish is required. Easy to sand with good adhesion. Available in white, black as well as custom colors from the chart below. NEW for 2016! – We can now have General Finishes match just about any manufacturers color deck with their Pigmented Poly. Just give us the color name and number, manufacturer, and we’ll do the rest! E-mail specifics here. Enduro Primer/Undercoat – Primers are necessary when a glass smooth painted finish is deisred. Basically the same as sanding sealer but with the addition of pigment. Product dries fast and sands easy. Brush and Gun Cleaner – Removes build up from spray equipment and other tools like brushes. General Finishes Extender – Helps retard dry time of all General and Enduro finishes and stains. Good all purpose retarder for water based dye stains. General Finishes Accelerator – Helps accelerate the dry time of any waterbased finish for better film formation. Used in cool, damp and humid conditions, it will accelerate drying by 20% +. HOMESTEAD COLORANTS – Our colorants have 100% compatibility with General Finishes and Enduro Products. 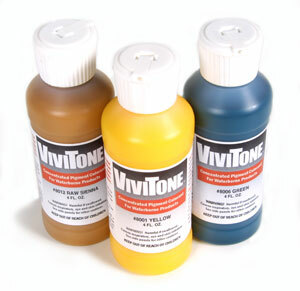 ViviTone™ Water-Base Pigment Colorants – These handy colors are available in standard Universal Colors in a flip-top style jar (4 oz and 8 oz only) for easy dispensing. Unlike traditional Universal Tinting Colorants that utilize a soft binder, these pigments are dispersed in 100% acrylic, ensuring a faster and harder dry and non-yellowing qualities. Has excellent light-fastness and all tints are exterior rated. Use for making glazes, stains, your own paints or any use where a water based colorant is needed. SIZES AVAILABLE 4 OZ., 8 OZ., 16 OZ. NOTE: “Yellow” is a bit warmer than “Light Yellow”. “Red” is an orange-y red, while “Quinacridone Red” is a bit more of a true red. 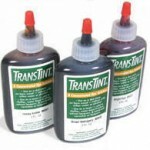 TransTint® Dyes – These concentrated dye colors are first rate for making your own stains using General Finishes stain base or water. Available in 19 colors comprising wood tones and primary colors. Can also be used to “tweak” stock colors. When adding to waterborne products, mix amount of TransTint that you will use with an equal amount of water prior to mixing. SIZES AVAILABLE 2 OZ., 8 OZ., 16 OZ., 32 OZ. Seal-A-Cell Clear for decades has served craftsman as the best way to get the that “natural” look on beautiful woods that aren’t to be stained. The oils penetrate deep within the wood to highlight the warm natural look and the urethane insures a deep hardness. Follow with multiple coats of Arm-R-Seal topcoat if more durability is required.Seal-A-Cell can be wiped on or applied with a foam brush. QUARTS ONLY. Arm-R-Seal Topcoat is made with only the highest quality urethane resin, making them extremely durable and long lasting. They are formulated to be wiped on with a cloth or applied with a foam brush, thus eliminating drips and sags. They penetrate to provide deep down protection and that “natural” look. 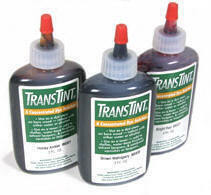 QUARTS ONLY – Gloss or Satin sheens. Gel Topcoat is one of the easiest oil finishes to apply. Gel Topcoat has a high content of urethane for more protection. Gel Topcoat is available in satin only. For semi-gloss or gloss sheens, use Arm-R-Seal Topcoat (above). QUARTS ONLY.